This extra-fine powder blusher gives smooth, buildable colour and has great staying power. Contains nourishing vitamin E and marula oil. This is long lasting and gives me a fresh looking flush that is anti-aging and soft. The coverage is buildable depending on the look you want. 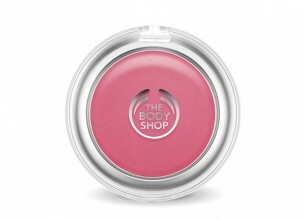 I love The Body Shop make-up, and this blusher is no exception. The powder is fine and velvety and leaves a soft and smooth finish on the skin. I have been using shade 06 Guava, and the colour lasts all day long! No need to reapply before going out at night. As the shade is quite bright and the pigment is rich I have to be careful with how much I apply, but had I chosen a more subtle shade I think this wouldn’t be a problem. I’d recommend shade 05 Bubblegum for light skin tones and the rich berry shade 10 Cherryade for dark skin tones.